As French railway entrepreneurs, the players try to connect as many cities of the country as possible to their rail network. One of the odder games to be released at Essen in 2010 was SNCF (Société Nationale des Chemins de fer Français) from Winsome Games. The oddity being that Winsome Games [http://www.fyi.net/~winsome/] is best known for developing, publishing, and licensing detailed, historical train games – board games that focus on the building and development of railway networks and the trading in the shares of railway companies. SNCF was anything other than detailed or historical, but was instead a simple track and share game that could be played in thirty minutes. Nevertheless, it offered up careful tactical play and was quickly licensed to Queen Games and released as Paris Connection. 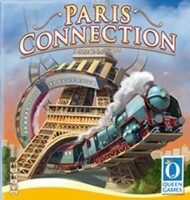 As both titles suggest, Paris Connection is set in France in which the players take the role of investors in the new railway companies that want to connect Paris with the rest of France. Designed for between three and six players, aged ten and over, the aim of the game is to increase the value of shares in one of six railway companies and to hold shares in these companies. Share values are increased by laying track and building connecting routes from Paris across France to her towns and cities. The first clever aspect of the game is that the wooden train pieces that represent the track or routes in the game also represent the shares in the company, so there will come a point at which it is more profitable to own shares in a company rather than build with them. The second clever aspect about the game is that share ownership is hidden throughout the game and only revealed at the very end, though share transactions are done in public. The game consists of a board depicting a map of France with her various towns and cities. Most towns are worth a single point when scored, but in general, the further a town or city is away from Paris, the more valuable it is to score. Around two sides of the board is a scoring track that runs from one to thirty, showing not a player’s score, but the share values for each company. Besides the main board, there is a small storage board for each of the game’s six sets of share/track pieces. These come in six colours, are done in wood, and are shaped like steam locomotives. There is a card screen for each player behind which he can hide his shares. The last two components are a black cloth bag used to determine random share ownership at the start of a game and two sets of rules. One set of rules is in French, the other in English. Both are double sided, done in full colour with one side explaining how to set the game and the other the game’s actual rules. Game set up is simple. Each player receives a screen and a train of each colour is placed on the start of the Scoring Track and on the start hexes in Paris. The remaining train pieces of all six colours are placed in the cloth bag and given a good mix. Each player then draws a number of random train pieces from the bag and hides them behind his screen. The number drawn depends on the number of players. The greater the number of players, the fewer the initial number of shares that they can hold at the start of the game and the fewer maximum shares that a player can hold at the end of the game without their scores being penalised. On his turn, a player has two options. He can either lay track or take shares. To lay track he takes up to five train pieces from any one storage board and places them board so that they are connected to trains of the same colour. To take shares, a player places one the shares he has behind his screen on the storage board that matches its colour and takes two shares of another colour from another storage board. This is only way in which a player can increase the number of shares that he holds. Play continues until there are only share/track pieces remaining on the single storage board with the remaining share/track pieces either behind the players’ screens or on the board. The other way to end the game is for a player to build into Marseilles. At this point everyone reveals the shares they hold behind their screens and receives points for each share according to its value on the Scoring Track. The player with the highest value share portfolio – after penalties are levied for holding more than the maximum number of shares – is the winner. Initially, the idea that you are not building your own railway and that you do not own train pieces of a single colour is counter intuitive. In almost every other game, you are building your own railway and you do own all of the train pieces of a single colour. Once past this stumbling block, Paris Connection presents one base tactical question and then a number of smaller questions to a player. That base question is, at what point does it become more valuable to hold multiple shares in a railway network than to extend that network? In other words, at what point do share/track pieces become more valuable as shares than as track? The subsequent and smaller questions revolve around how does a player affect the share values in the other rail networks? The game is not complicated enough that it includes rules on how to reduce share value, but it is possible to limit the growth in share value. The most obvious means is place the share/track pieces in such a way that they do not connect to any town or city and so do not score any points. Thus a rail network’s share value is not increased for a player’s turn. The last question that a player needs to address is, how quickly does he need a rail network need to get to Marseilles? It might be that with several high value shares in his portfolio, he might want to end the game early to capitalise on those values. Conversely, the other players might want to lay track in a high value share to both stop it rising in value and it reaching Marseilles, hopefully giving them time to improve other share values and increase their portfolios. There are three great aspects to Paris Connection. First, there is its simplicity. The rules are not only simple to learn, they are also simple to teach. 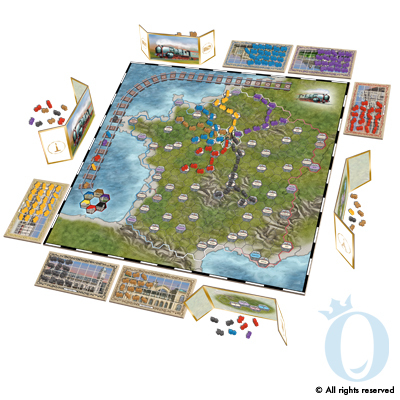 In fact, the game is simple enough that after a single read through of the rules; a group could get playing, meaning that it is entirely possible to play Paris Connection out of the box. The second great aspect is that the game has almost no randomness to it, and what there is, consists of determining each player’s share portfolio at game’s start. The third great aspect is that this is a Euro Game not for two to five players as many good Euro Games are, but for three to six, and light games for six players are not necessarily all that common. The production values on Paris Connection are very high. The board is attractively done and clearly laid out. The screens are nice, though prone to falling over. The wooden train-shaped track/share pieces are equally attractive if a little small and perhaps fiddly to handle. The rules sheet is bright and easy to read. Yet these high production values are source of the game’s single real flaw. Paris Connection is not an inexpensive game. In fact it is an expensive game given both how long a play through lasts and how simple it is. It is engaging and enjoyable to play, but it does not offer value for money. The purchase of the copy of Paris Connection that we have been playing was an impulse buy. The promised lightness of the rules and the upper limit on the number of players were the draw despite the price. Having played it a few times, we have found it to be light and easy, but still offering some tactical choices. Not only is Paris Connection an excellent filler game, it is also a good starter game, a title that can be played and enjoyed with casual games players… that is, if you are happy to overlook the price. Add a Review for "Paris Connection"